Are you looking for the famous lard bread spread from Germany? Here is the German Griebenschmalz Recipe, the popular lard bread spread. 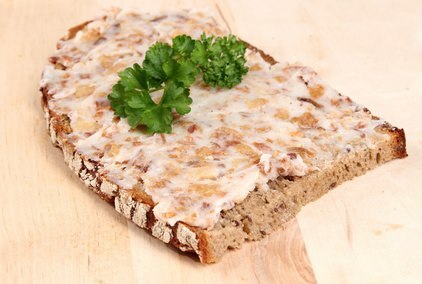 Griebenschmalz is made out of Flomen (leaf lard) and Pork Speck (belly fat). This is an original and authentic German recipe and that's how it is been made in Germany. Grieben are the onions and apples combines with spices and the lard. Happy Cooking! What is the difference between Speck and Bauchspeck? Speck - Fat contained in cuts of pork. It can be used raw or cured and smoked. You may render it into lard or use it to flavor other foods. Only rarely is it used as the main meat. Bauchspeck - Savory bacon which comes from the pork belly and is marbled with muscle and fat. It is usually purchased cured, smoked and air-dried. Leaf lard is the highest grade of lard (lard is pork fat, the term is usually used to refer to rendered pork fat suitable for cooking). It comes from the "soft"fat from around the kidneys and loin of the pig. This kind of lard lacks any real pork or meaty flavor, making it an excellent neutral-flavored cooking fat with a high smoking point. Leaf lard can be tricky to track down. Some small butcher shops make and sell it. Rendering your own is quite simple if you can find the fat. Place the pork fat in a pot, and gently heat it on the stove or in the oven until the fat is melted and any bits of meat are rendered out (they will be browned and crisp and delicious, by the way). Transfer the lard to a container with a seal-able lid and store, chilled, for up to a month. Happy Cooking! - Wash flomen and pat it dry. - Chop speck and flomen in small cubes, chop onions, peel apples and remove cores, cut into quarters. - Melt speck and flomen on medium heat. - Add onions and apples to the lard, then the spices. - Let it melt on low heat until it is clear. - Grieben are the onions and apples with the spices. Stir frequently. - When everything is liquid let it simmer for a bit, and when the apples and onions are slightly brown fill it in a ceramic form. You can find special pots in Germany called "Schmalztopf", especially designed pots for making the Griebenschmalz. Don't move the form before the lard is really firm. This can take up to 2 days.